Activity: Visit to Toledo. Services: Heated Coaches and Official Tourist Guides. Departure: Daily April to October - From November to March: Tuesday, Thursday, Saturday and Sunday. Time: morning 9:00. Starting point: terminal at Plaza de Oriente, 8. Conditions: Advance booking required. Cancellation fee: 100% for less than 24 hours notice or no-shows. Languages: Spanish and English. Duration: 8 hours approx. Information: Includes visits to religious monuments which are not allowed to enter with bare shoulders and knees, especially for ladies. Excursion not recommended for people with physical restrictions or difficulty walking. 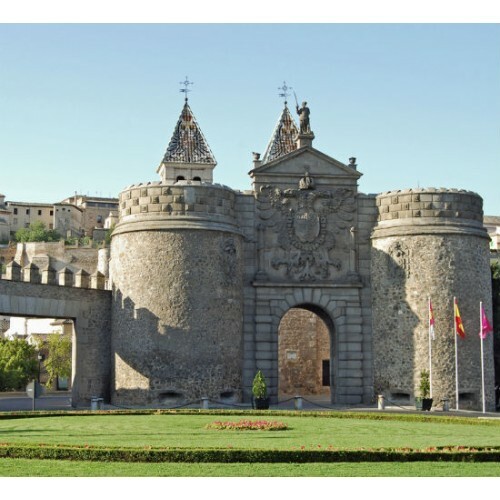 TOLEDO is a Museum – City of great artistic beauty, it was capital of the country and offers magnificent examples of architecture from different epochs, Arab, Jewish and Catholic, that make it one of the leading artistic cities in Spain. It was declared A WORLD HERITAGE SITE by Unesco. 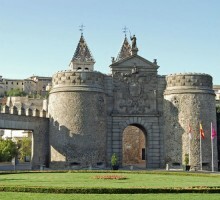 On arrival, you will go for a SIGHTSEEING TOUR and walk through the city, to admire its beautiful streets and monuments, visiting, the MAIN CATHEDRAL, the SANTO TOMÉ CHURCH, (“The Burial of the Count of Orgaz”, El Greco’s masterpiece), VICTORIO MACHO MUSEUM ( Sculpture Museum and a Documentary film with a searching profile of soul of Toledo ), the SANTA MARIA LA BLANCA SYNAGOGUE, SAN JUAN DE LOS REYES CHURCH and THE CRISTO DE LA LUZ MOSQUE. You will also be able to admire, among the rich artisan crafts, the technique of “Damasquinado” (the incrustation of precious metals on steel). Option to choose lunch in a typical Restaurant. Sautéed Mixed vegetables, Veal Loin with Green Beans and Potatoes, Ice Cream with fruit salad. Castillian aperitifs and tapas, Roast shoulder of lamb with savoury vegetables, Truffle tart with ice cream, Wine, Water and Coffee.